For research and scholarship that changes the world. 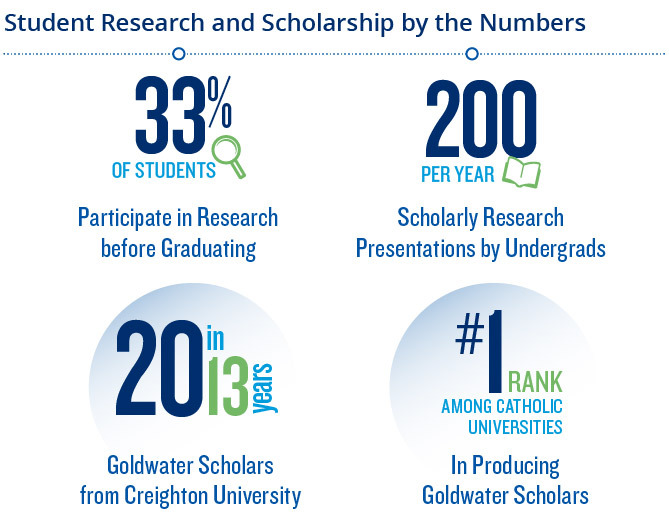 Research and scholarship is an integral part of Creighton’s College of Arts and Sciences. U.S. News & World Report recently recognized Creighton as one of 42 institutions offering creative and innovative undergraduate research projects. Become a part of it with the Center for Undergraduate Research and Scholarship (CURAS), the premier location to discover undergraduate research and scholarship opportunities, connecting faculty and students together. At Creighton, you don’t have to wait until you’re a graduate student to participate in research. As early as your freshman year, you can work side-by-side with world-renowned faculty members. By getting involved in research as an undergraduate, you set yourself apart when applying for graduate school, national research scholarships, internships—and future careers. You could be one of dozens of students who have presented their work at national and international conferences. Or you might co-author a published peer-review journal article. Visit CURAS to learn about undergraduate research opportunities. 33 percent of Creighton students participate in research. Undergraduate students present about 200 scholarly presentations each year. In 13 years, 20 Goldwater Scholars were Creighton College of Arts and Sciences students, making Creighton a leader among peer institutions in numbers of students earning this honor. Undergraduate research opportunities have been invaluable in both preparing me for graduate school and forming and solidifying my resolve to pursue a career in high-energy physics research. Are you an undergraduate researcher? Share your story!